Once used as a kitchen utensil, the Champagne bucket, through interplay of design codes, materials and shapes, has earned its status as a design object that is proudly displayed. Glass champagne bucket with platinum finish 22 cm - 8,75in. In just a short amount of time, the Champagne bucket has become a trendy and contemporary object that is proudly displayed without hesitation. That is why Peugeot offers a collection par excellence where each Champagne bucket guarantees refreshment and maintains the ideal tasting temperature for wines and Champagnes. 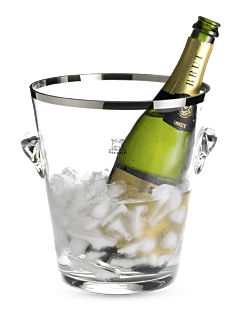 Filled with crushed ice or ice cubes, the Peugeot Champagne bucket gradually refreshes all bottles to reveal, enhance and affirm the power and subtlety of the aromas of wines, sparkling wines and Champagnes at just the right temperature. It perfectly suits all table settings with the elegance and sobriety appropriate for such occasions.